The board of directors announced Wednesday, March 27 that the search is underway for a new leader for the Chamber. The Executive Director position, held most recently by Mindi Terrell, is the driving force of the Chamber, and is vital to the success of its mission and programs. The Board will be accepting resumes for this position until April 12. If you are interested in the position, please see the the ad posted here. With great sadness, I write to tell you that Mindi Terrell passed away on Tuesday, March 12. Mindi served as the Executive Director of the Chamber from October 2015 to the present. 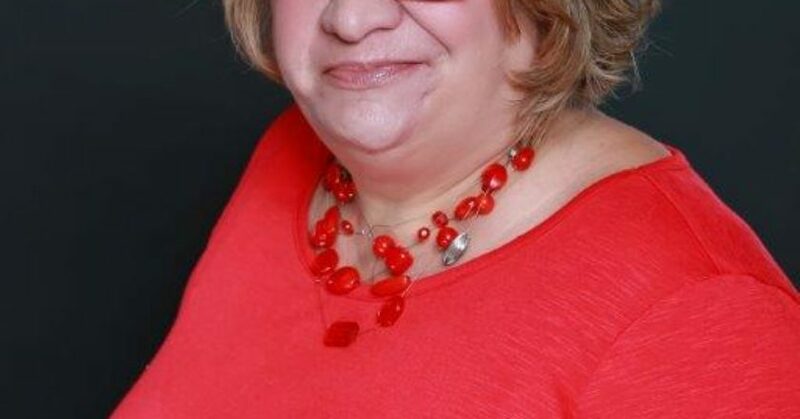 Her contributions to the Chamber are numerous: some of her proudest include the Lunch & Learn series, the Chamber Buzz emails, and trying out new events to promote our members. Mindi was dedicated to the success of the Chamber and could often be found researching new ideas to benefit the membership. She was a driving force and her energy and enthusiasm will be greatly missed. Her obituary can be found here. 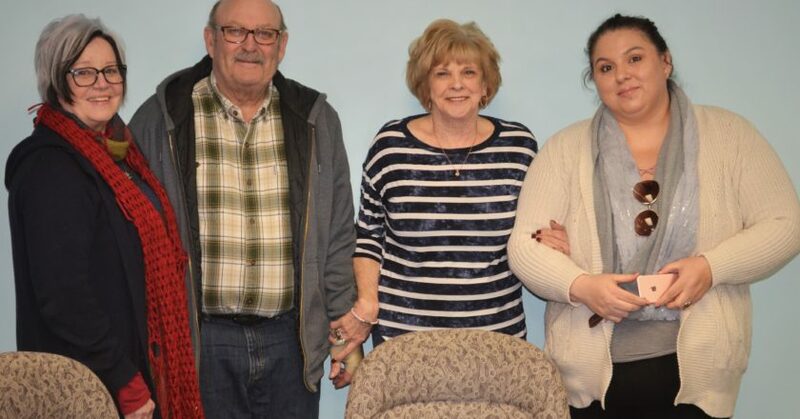 In lieu of flowers, Mindi’s wish was for memorial donations to be sent to the American Cancer Society or the United Way of Livingston County. This year, the Pontiac Area Chamber is pleased to announce two winners for the Bill Edwards Agri-Business Person of the Year award. Jesse Faber and Parker Bane, both agriculture teachers at Pontiac Township High School, have been selected as this year’s recipients and we look forward to honoring them at the Annual Banquet, to be held March 7th at the Pontiac Elks Lodge. They are pictured above with their families. Paul Kelly of KSR nominated the two teachers for the award, based on their exponential impact on the agriculture industry in Pontiac through educating local students interested in pursuing Ag as a career. Jesse Faber also has made important contributions to the agriculture program at PTHS. “His students consistently perform at a top level when entered into competition,” says Kilgore, who also notes that the excellence and reputation of the agriculture program has allowed it to grow even when the overall school enrollment has dropped. 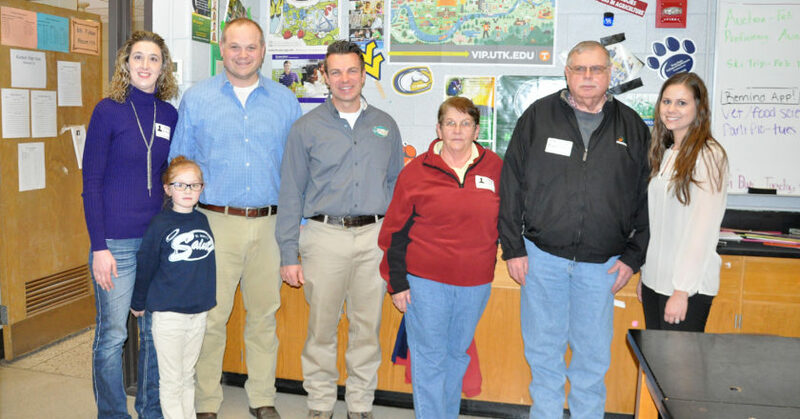 Both teachers have proven themselves to be a vital part of the local agriculture community. Their commitment to excellence instills their students with a love of agriculture in a way that stimulates the local ag industry and will continue to do so for generations to come. To attend the Annual Banquet and honor these award recipients, please RSVP to the Pontiac Area Chamber by February 27. The cost is $30 per person to attend. More information can be found here. 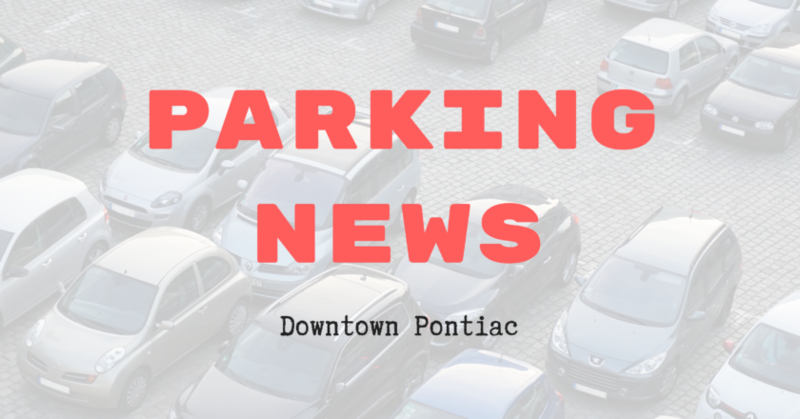 The Pontiac Area Chamber is a non-profit organization committed to creating and maintaining a favorable business climate in the Pontiac area; and to stimulating pride and involvement among its constituency. 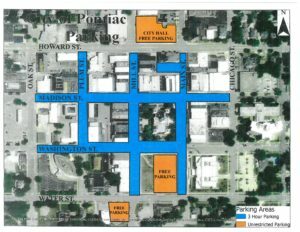 It was created in 1917 and currently has more than 240 member businesses from Pontiac and the surrounding communities. 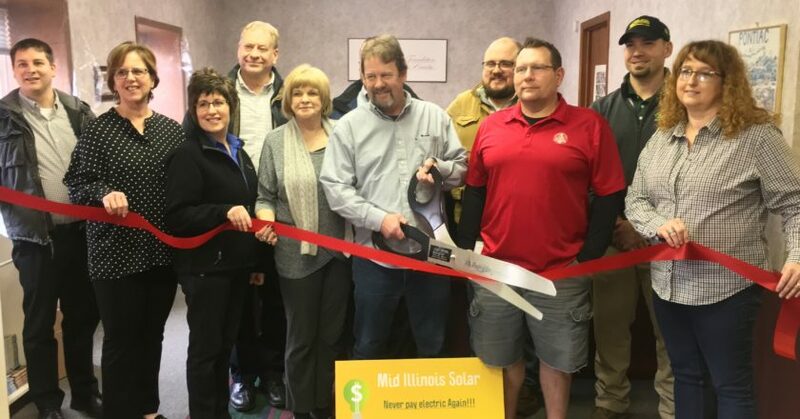 The Chamber welcomed a new member, Mid Illinois Solar, today with a ribbon cutting. 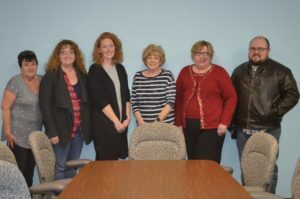 Representatives from the board of directors as well as local news media were in attendance. Owner Mark Smith shared with the group his goal to help people understand the complicated process of owning their own solar power, and to guide them through grant writing, tax deductions, and permitting. Anyone interested should contact him at 815-674-0282 or visit www.midillinoissolar.com. Best of luck to you, and welcome to the Chamber! 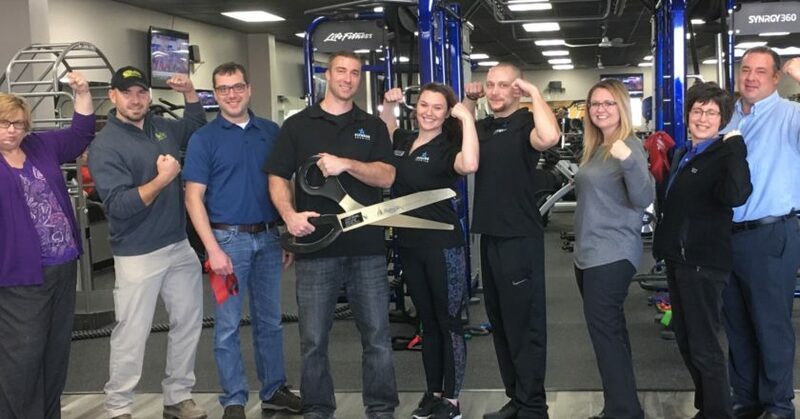 The Pontiac Area Chamber and representatives welcomed Fitness Premier on Tuesday, January 8 with a ribbon cutting. Fitness Premier, located at 924 W. Custer in Pontiac, is a physical fitness center whose mission is “to motivate, educate, and inspire the communities we serve.” They offer 24/7 access for members to exercise using their state-of-the-art equipment, and staff is available during their regular business hours to provide support, education, and even personal training. Group classes are available. If you’re looking to start your New Year’s fitness resolution, now is the time! Fitness Premier is offering $0 enrollment through January 31. 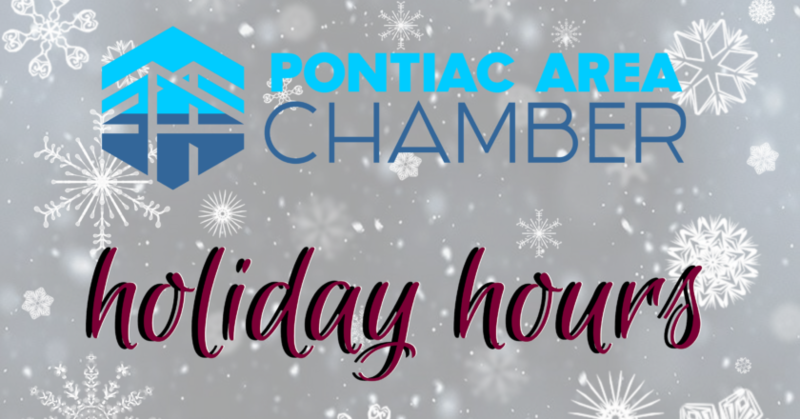 The Chamber will have shortened hours on Monday, December 24, 2018, closing at 2:00 pm. We will then be closed Christmas Day and December 26 for the holiday. We will resume normal business hours on Thursday, December 27. Happy holidays from all of us at the Chamber! 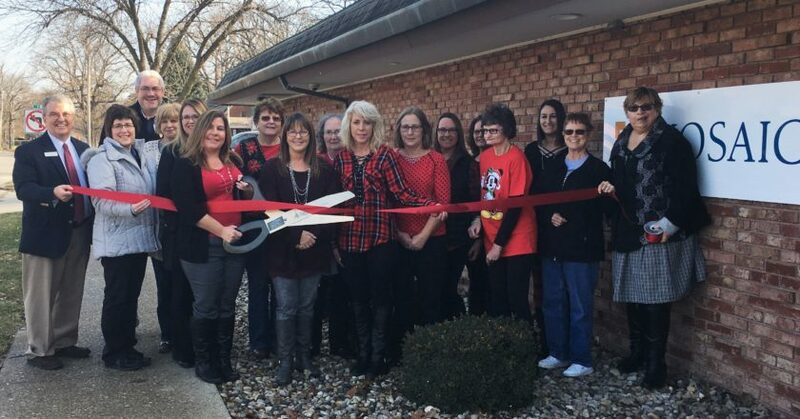 Chamber representatives and other local leaders gathered at MOSAIC to celebrate the opening of the new location with a ribbon cutting. Congratulations on a successful move! MOSAIC has been serving the people of Pontiac since 1982, advocating for individuals with disabilities and providing opportunities for them to learn and grow within the community. Thanks for all you do – we’re proud to have you as a member! Calvert & Martin will be hosting the December Mix & Mingle on Thursday, December 13 from 5:00 – 7:00 pm. Come join us at the Pontiac Elks Lodge as we celebrate city employees and politicians. It will be a free evening of socializing and great food. Everyone is welcome. 459 Elks Club Road, Pontiac. RSVP no later than Friday, December 7. 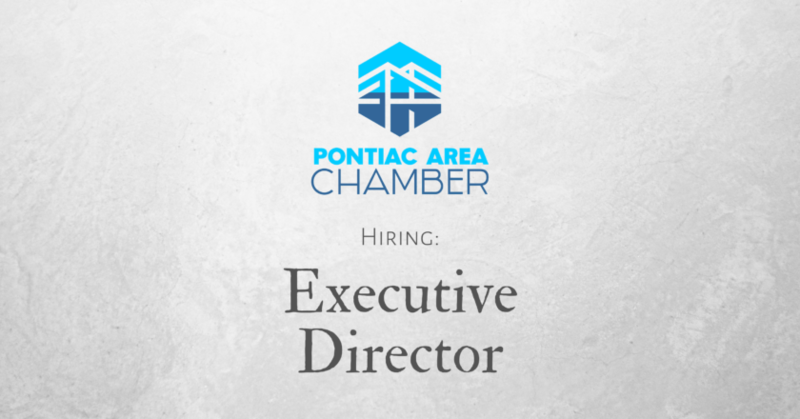 Call 815.844.5131 or email admin@pontiacchamber.org.